Dr. Antonescu’s research papers can be found here. The acyltransferase LYCAT maintains the acyl profile and levels of specific phosphoinositides and associated endomembrane traffic. Phosphoinositides (PIPs) are key regulators of membrane traffic and signaling. 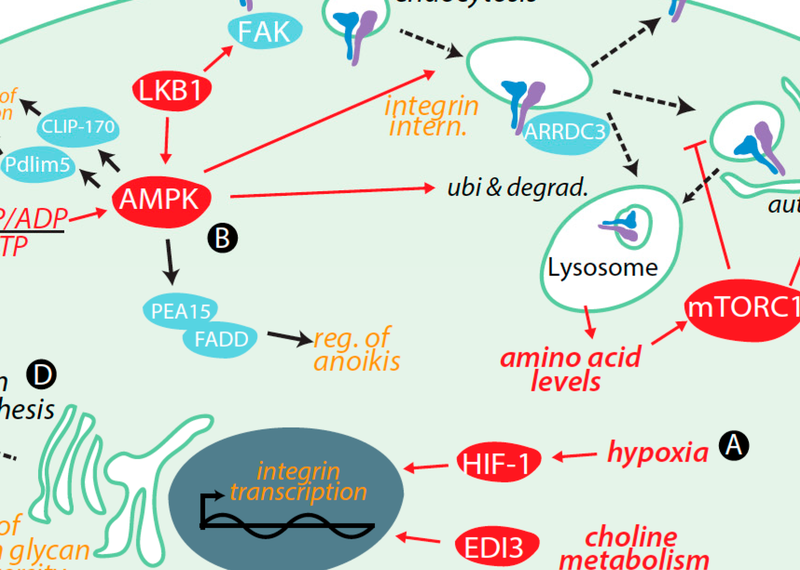 The interconversion of PIPs by lipid kinases and phosphatases regulates their functionality. Phosphatidylinositol (PI) and PIPs have a unique enrichment of 1-stearoyl-2-arachidonyl acyl species; however, the regulation and function of this specific acyl profile remains poorly understood. We examined the role of the PI acyltransferase LYCAT in control of PIPs and PIP-dependent membrane traffic. LYCAT silencing selectively perturbed the levels and localization of phosphatidylinositol-4,5-bisphosphate [PI(4,5)P2] and phosphatidylinositol-3-phosphate and the membrane traffic dependent on these specific PIPs but was without effect on phosphatidylinositol-4-phosphate or biosynthetic membrane traffic. The acyl profile of PI(4,5)P2 was selectively altered in LYCAT-deficient cells, whereas LYCAT localized with phosphatidylinositol synthase. We propose that LYCAT remodels the acyl chains of PI, which is then channeled into PI(4,5)P2. Our observations suggest that the PIP acyl chain profile may exert broad control of cell physiology. Selective regulation of clathrin-mediated epidermal growth factor receptor signaling and endocytosis by phospholipase C and calcium. Clathrin-mediated endocytosis is a major regulator of cell-surface protein internalization. Clathrin and other proteins assemble into small invaginating structures at the plasma membrane termed clathrin-coated pits (CCPs) that mediate vesicle formation. In addition, epidermal growth factor receptor (EGFR) signaling is regulated by its accumulation within CCPs. Given the diversity of proteins regulated by clathrin-mediated endocytosis, how this process may distinctly regulate specific receptors is a key question. We examined the selective regulation of clathrin-dependent EGFR signaling and endocytosis. We find that perturbations of phospholipase Cγ1 (PLCγ1), Ca2+, or protein kinase C (PKC) impair clathrin-mediated endocytosis of EGFR, the formation of CCPs harboring EGFR, and EGFR signaling. 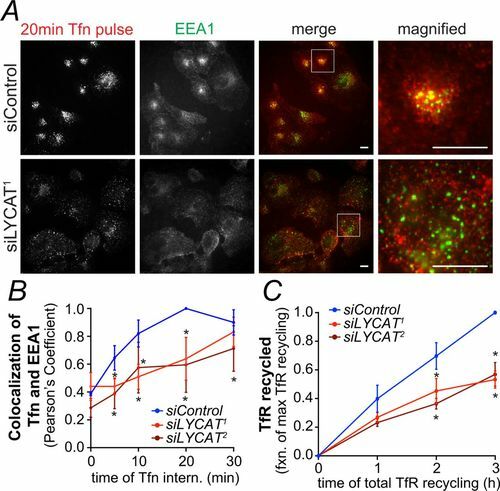 Each of these manipulations was without effect on the clathrin-mediated endocytosis of transferrin receptor (TfR). EGFR and TfR were recruited to largely distinct clathrin structures. 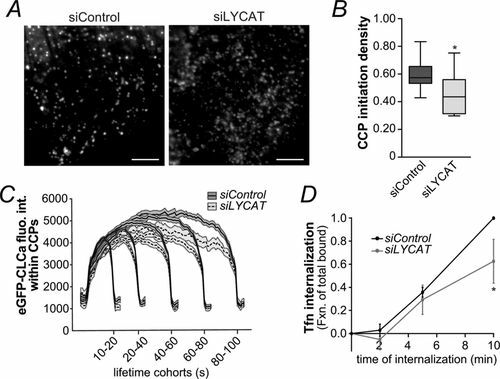 In addition to control of initiation and assembly of CCPs, EGF stimulation also elicited a Ca2+- and PKC-dependent reduction in synaptojanin1 recruitment to clathrin structures, indicating broad control of CCP assembly by Ca2+ signals. Hence EGFR elicits PLCγ1-calcium signals to facilitate formation of a subset of CCPs, thus modulating its own signaling and endocytosis. This provides evidence for the versatility of CCPs to control diverse cellular processes. The big and intricate dreams of little organelles: Embracing complexity in the study of membrane traffic. Compartmentalization of eukaryotic cells into dynamic organelles that exchange material through regulated membrane traffic governs virtually every aspect of cellular physiology including signal transduction, metabolism and transcription. Much has been revealed about the molecular mechanisms that control organelle dynamics and membrane traffic and how these processes are regulated by metabolic, physical and chemical cues. From this emerges the understanding of the integration of specific organellar phenomena within complex, multiscale and nonlinear regulatory networks. In this review, we discuss systematic approaches that revealed remarkable insight into the complexity of these phenomena, including the use of proximity-based proteomics, high-throughput imaging, transcriptomics and computational modeling. 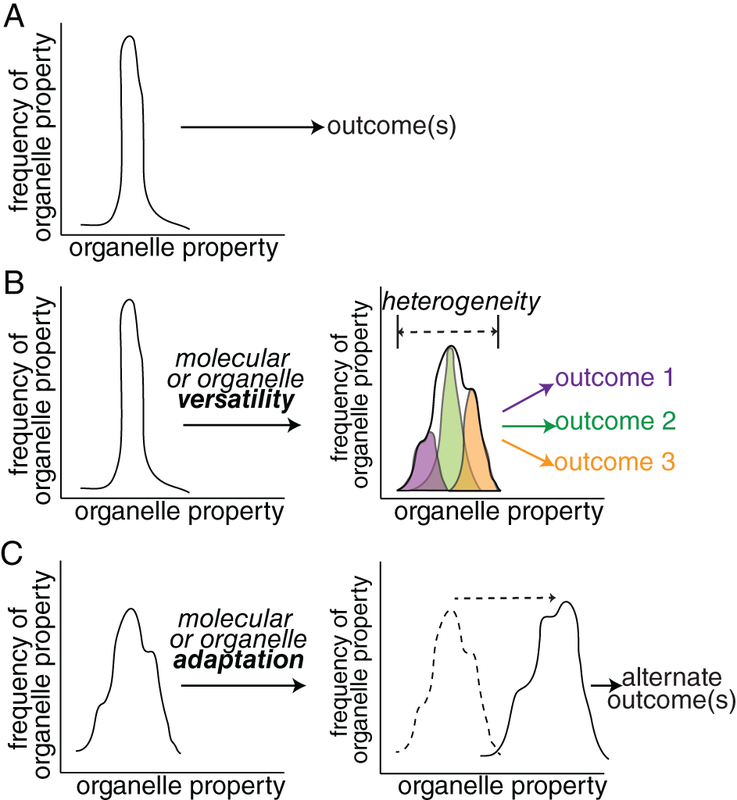 We discuss how these methods offer insights to further understand molecular versatility and organelle heterogeneity, phenomena that allow a single organelle population to serve a range of physiological functions. 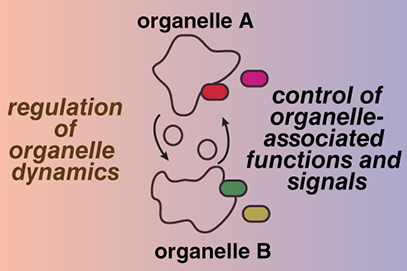 We also detail on how transcriptional circuits drive organelle adaptation, such that organelles may shift their function to better serve distinct differentiation and stress conditions. Thus, organelle dynamics and membrane traffic are functionally heterogeneous and adaptable processes that coordinate with higher-order system behavior to optimize cell function under a range of contexts. Obtaining a comprehensive understanding of organellar phenomena will increasingly require combined use of reductionist and system-based approaches. Measurement of Epidermal Growth Factor Receptor derived signals within plasma membrane clathrin structures. The epidermal growth factor (EGF) receptor (EGFR) is an important regulator of cell growth, proliferation, survival, migration, and metabolism. EGF binding to EGFR triggers the activation of the receptor's intrinsic kinase activity, in turn eliciting the recruitment of many secondary signaling proteins and activation of downstream signals, such as the activation of phosphatidylinositol-3-kinase (PI3K) and Akt, a process requiring the phosphorylation of Gab1. While the identity of many signals that can be activated by EGFR has been revealed, how the spatiotemporal organization of EGFR signaling within cells controls receptor outcome remains poorly understood. Upon EGF binding at the plasma membrane, EGFR is internalized by clathrin-mediated endocytosis following recruitment to clathrin-coated pits (CCPs). Further, plasma membrane CCPs, but not EGFR internalization, are required for EGF-stimulated Akt phosphorylation. Signaling intermediates such as phosphorylated Gab1, which lead to Akt phosphorylation, are enriched within CCPs upon EGF stimulation. These findings indicate that some plasma membrane CCPs also serve as signaling microdomains required for certain facets of EGFR signaling and are enriched in key EGFR signaling intermediates. Understanding how the spatiotemporal organization of EGFR signals within CCP microdomains controls receptor signaling outcome requires imaging methods that can systematically resolve and analyze the properties of CCPs, EGFR and key signaling intermediates. 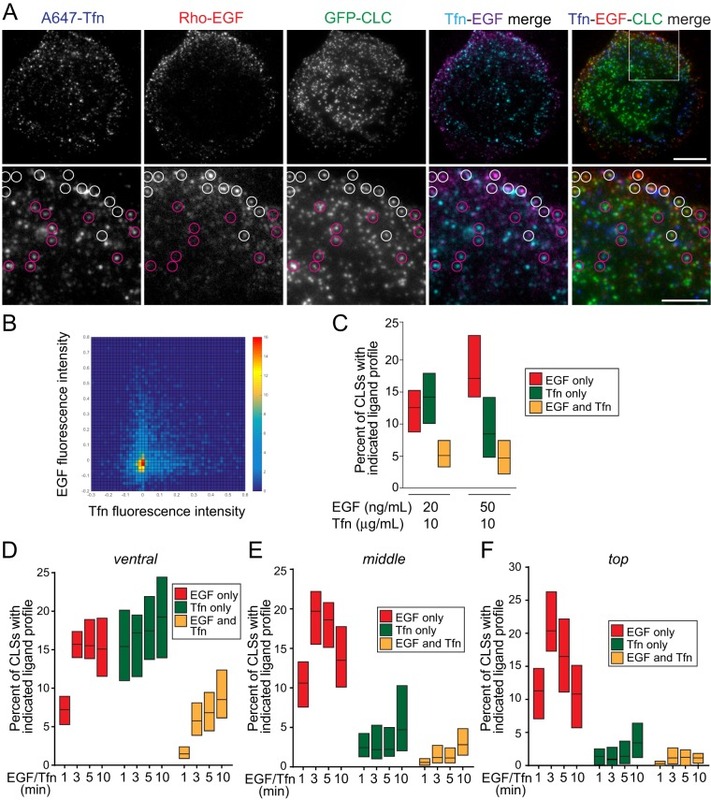 Here, we describe methods using total internal reflection fluorescence microscopy imaging and analysis to systematically study the enrichment of EGFR and key EGFR-derived signals within CCPs. Integrins and Cell Metabolism: An Intimate Relationship Impacting Cancer. Int J Mol Sci.18(1). pii: E189. Integrins are important regulators of cell survival, proliferation, adhesion and migration. Once activated, integrins establish a regulated link between the extracellular matrix and the cytoskeleton. Integrins have well-established functions in cancer, such as in controlling cell survival by engagement of many specific intracellular signaling pathways and in facilitating metastasis. Integrins and associated proteins are regulated by control of transcription, membrane traffic, and degradation, as well as by a number of post-translational modifications including glycosylation, allowing integrin function to be modulated to conform to various cellular needs and environmental conditions. In this review, we examine the control of integrin function by cell metabolism, and the impact of this regulation in cancer. Within this context, nutrient sufficiency or deprivation is sensed by a number of metabolic signaling pathways such as AMP-activated protein kinase (AMPK), mammalian target of rapamycin (mTOR) and hypoxia-inducible factor (HIF) 1, which collectively control integrin function by a number of mechanisms. Moreover, metabolic flux through specific pathways also controls integrins, such as by control of integrin glycosylation, thus impacting integrin-dependent cell adhesion and migration. Integrins also control various metabolic signals and pathways, establishing the reciprocity of this regulation. As cancer cells exhibit substantial changes in metabolism, such as a shift to aerobic glycolysis, enhanced glucose utilization and a heightened dependence on specific amino acids, the reciprocal regulation of integrins and metabolism may provide important clues for more effective treatment of various cancers. The ENU-3 Protein Family Members Function with the Netrin and Wnt Pathways to Promote Motor Neuron Axon Outgrowth in C. elegans. The axons of the DA and DB classes of motor neurons fail to reach the dorsal cord in the absence of the guidance cue UNC-6/Netrin or its receptor UNC-5 in C. elegans. However, the axonal processes usually exit their cell bodies in the ventral cord in the absence of both molecules. Strains lacking functional versions of UNC-6 or UNC-5 have a low level of DA and DB motor neuron axon outgrowth defects. We found that mutations in the genes for all six of the ENU-3 proteins function to enhance the outgrowth defects of the DA and DB axons in strains lacking either UNC-6 or UNC-5. A mutation in the gene for the MIG-14/Wntless protein also enhances defects in a strain lacking either UNC-5 or UNC-6, suggesting that the ENU-3 and Wnt pathways function parallel to the Netrin pathway in directing motor neuron axon outgrowth. Our evidence suggests that the ENU-3 proteins are novel members of the Wnt pathway in nematodes. Five of the six members of the ENU-3 family are predicted to be single-pass trans-membrane proteins. The expression pattern of ENU-3.1 was consistent with plasma membrane localization. One family member, ENU-3.6, lacks the predicted signal peptide and the membrane-spanning domain. In HeLa cells ENU-3.6 had a cytoplasmic localization and caused actin dependent processes to appear. We conclude that the ENU-3 family proteins function in a pathway parallel to the UNC-6/Netrin pathway for motor neuron axon outgrowth, most likely in the Wnt pathway. Ultrasound and microbubble induced release from intracellular compartments. 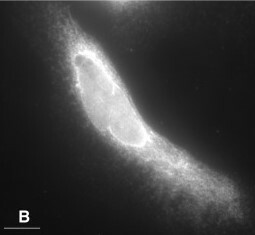 Ultrasound and microbubbles (USMB) have been shown to enhance the intracellular uptake of molecules, generally thought to occur as a result of sonoporation. The underlying mechanism associated with USMB-enhanced intracellular uptake such as membrane disruption and endocytosis may also be associated with USMB-induced release of cellular materials to the extracellular milieu. This study investigates USMB effects on the molecular release from cells through membrane-disruption and exocytosis.